Holden revealed it would build its last homegrown Commodore ever on October 20, 2017, just a week ago. But, it wants to ensure the beloved nameplate doesn’t go without one last hurrah. We knew they were coming, but Holden has officially revealed three limited edition Commodores to say farewell to the locally-assembled vehicle in the Commodore Motorsport Edition, Director and Magnum ute. The three commemorative Commodores were revealed following the inaugural introduction of the new 2017 Red Bull Holden Racing Team Supercars, and each brings very unique takes on what has made Commodore a household name over decades of continual production. Though, each share similarities. As the result of a skunkworks-like project, Holden engineers looked to the Chevrolet SS, Corvette and Camaro to see how Commodore could benefit. Engineers took everything learned over years working with the Zeta platform and developed engine and transmission cooling packages to meet “GM Level 3” track performance requirements. “Motorsport Edition, Director and Magnum have developed from a Holden team passion project into road-going homages to our people and our rich heritage. 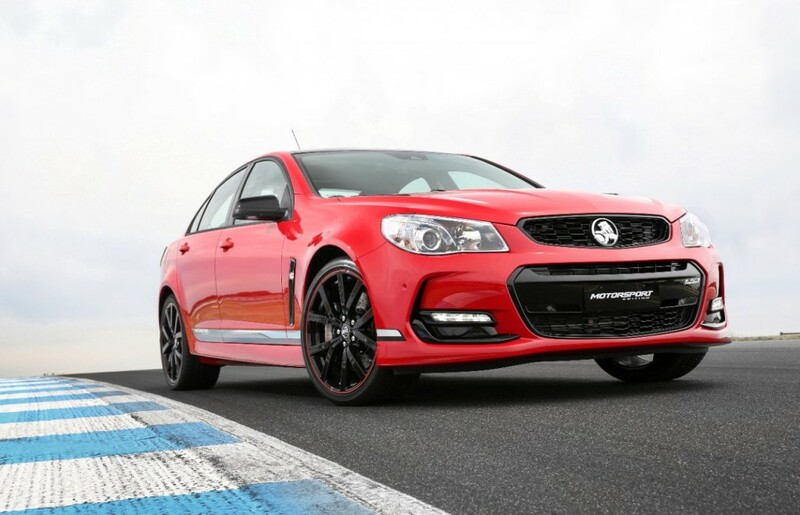 They blend performance and technology to create the most capable Commodores we’ve ever built,” said Holden’s Limited Editions Lead Development Engineer, Daniel Pinnuck. No matter which special edition, ‘floating disc’ front and rear cross-drilled rotors, an engine and transmission cooling package and 20-inch split wheels and tires are present, while Motorsport and Director receive the Magnetic Ride Control system found on the 2017 Chevrolet SS. To further break down what each edition brings to the table, we’ll dig in a little deeper for each vehicle separately. Over decades, Commodore has racked up over 460 Australian Touring Car Championship and V8 Supercars victories, and the Motorsport Edition honors its success on the track. Red accents can be seen throughout the Motorsport Edition, which include red mirror scalps and pinstriping around the 20-inch wheels. An optional lip spoiler and standard black roof help differentiate the Motorsport Edition from any other Commodore. Inside, “Motorsport” is embroidered throughout the cabin and heated performance seats are standard. Each Motorsport Edition receives individual vehicle numbering and unique build option codes. A scale model of each Motorsport Edition is also included. The controversial Director nameplate returns for the Commodore’s farewell. Meant to represent the ultimate mix of performance and luxury, the Calais-based Director adds a black roof, paddle shifters and hood vents and stands as a tribute to the original Director and the man that created it, the late, great, Peter Brock. The Director receives identical engine and transmission improvements but arrives with more exclusivity with unique Director badging, alloy pedals and a commemorative presentation case to honor the vehicle. The Director is also finished an exterior hue similar to the original nameplate’s color for added nostalgia. Holden Dealer Team took Australia by storm with the original Commodore Magnum in 1983, but Holden wants to put the thoroughly Australian ute bodystle to bed with a bang. In the engineering process, Holden says it has created the quickest ute it has ever built, worthy of the Magnum badging. Again, the same track-focused engine and transmission upgrades are present, though, the Commodore Magnum receives a sedan-tuned FE3 suspension, honed for greater handling. A hard tonneau cover, unique badging, performance seats and a commemorative display case also come with the Magnum. As you can see from each sub-heading, Holden has already capped production for each limited edition Commodore and the brand has already received 2,000 inquiries for interest in these vehicles. So, if you’re keen on owning history, you’d best move quickly before this going away party is completely sold out. That is unless you’re waiting for HSV’s farewell to the Commodore in form of a 2017 GTS-R W1. IMHO, the Chevrolet SS should’ve received the same treatment. Hate the fact they never brought the Ute to USA. Now for sure it’s never gonna happen. What a waste.